'We Try It' is a regular series where we try the latest off-beat food and beverage offerings. 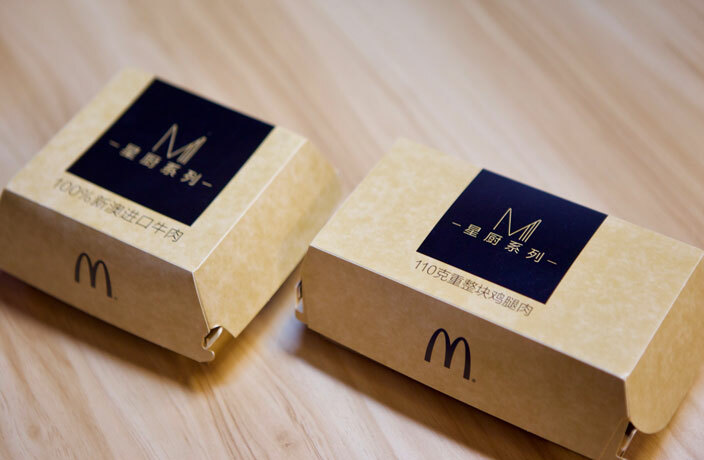 They’ve done it again, and by they, we mean McDonald’s and the almost-as-famous Michelin Guide – two culinary juggernauts whose names we thought we’d never hear in the same sentence. That is, until December of last year, when McDonald’s launched two specialty burgers endorsed by a two-star Michelin chef, Spain’s Ramón Freixa. While we had mixed feelings after sampling last year’s Signature Sauce Bacon Burger and BBQ Pineapple Beef Burger, clearly the response was enough to coax ‘the powers that be’ at McDonald’s to give it another go. Being the culinary cosmonauts that we are, and obviously caring so deeply about our readers’ taste buds and overall health, we decided to sample these two new burgers and report back our findings. When we opened the box of the Creamy Nuts and Steamed Egg Beef Burger (RMB28), we were greeted by a sandwich that appeared to have been made with the same level of care afforded to a crash-test dummy. In short: the presentation was sloppy. Ingredient-wise, the burger is built with 100 percent beef (allegedly), a steamed egg reminiscent of what you’ll find in any McDonald’s breakfast sandwich, lettuce, onions, what tasted like Big Mac sauce and creamy peanut butter. Despite the burger looking like was made by Ryan Reynold's character in the film Waiting..., it actually was quite alright. The smooth, savory taste was pleasant to the palate and the addition of an egg to a McDonald’s meal served after 10am was strangely satisfying. Up next was the Chipotle BBQ-Style Chicken Burger (RMB28), which, thankfully, came out of the box with a better presentation than the first sandwich (albeit barely). The burger comes with a dose of tangy chipotle sauce and chicken that appears to have been battered and fried – not barbecued, as the name suggests. Other components include lettuce, tomatoes and bacon that looks like ham, all stuffed inside a hearty, seed-covered bun that was about an inch-and-a-half too long for its contents. This sandwich’s strongest points are undoubtedly its aesthetically-pleasing bun and the chipotle sauce – which was key in covering up the taste of undercooked bacon. Its weaknesses? Definitely the bacon (did we mention the sad bacon yet?) and the small portion of slightly-soggy chicken. If we had to recommend one of the new Michelin monstrosities, we’d have to jump behind the Creamy Nuts and Steamed Egg Beef Burger – which, although far from perfect, managed to at least execute the meat to bun ratio to an acceptable degree. While browsing the McDonald’s menu we also noticed a couple other new(ish) additions, including Maple Syrup-Flavored Wings and Loaded Fries (French fries topped with BBQ and cheese sauces). While we did not dabble with the presumably Canadian-inspired wings, we did order the Loaded Fries (RMB13) and can report that they’re terrible. If you are dead-set on giving these ‘failure fries’ a try, be forewarned: the cheese sauce is essentially watery Cheese Whiz and the BBQ sauce would not be welcome within 100 meters of any self-respecting person’s grill. Unsure where to celebrate Easter this weekend? We've got you covered. In town for the holiday and have nothing to do? Check out our picks. From lush dinners to goofy jumper parties, here's a list of all the goodness to look forward to in the coming weeks. More chances for holiday merriment and other foodie fun. Do these 19 things, NOW!